Travel through time to save the world in this 3DS remake of Radiant Historia. JRPG fans won’t want to miss this fine genre piece from the good folks over at Atlus – especially those of us in Europe, who never got to play the game the first time around. Radiant Historia began life as a DS game back in 2010 (2011 in the USA), earning rave reviews thanks to a smart plot, great graphics and fun gameplay. Suffice to say, Radiant Historia: Perfect Chronology retains all of the aspects that made the original so good in the eyes of many, and expands on them. Not content with a simple port, Atlus decided to take their time in developing the 3DS edition of Radiant Historia. Newly added is a solid voice-cast, updated, widescreen graphics and a decent amount of brand new story content. I never got a chance to play the original game, so I cannot comment on the finer details of what has and has not changed, but based on what I know, there might not be quite enough for those who played the original game to double dip here. The graphics, for example, while improved to some extent, won’t blow you away like they did on the DS. The widescreen view allows for more of the game’s wonderful landscapes to envelope the screen, but all told, it looks like a sharper, brighter DS game. It doesn’t matter much, however, as the sprites are spectacular and the world looks lush and well-designed still. What I do wish, mind, was that the game made the most of the 3DS’ stereoscopic 3D. It’s such a waste that you cannot play the game in 3D, the diorama-like world would vividly pop from the screen wonderfully and allow for layered-looking battle scenes. It’s a crying shame. To be honest, however, this is my biggest complaint of Radiant Historia: Perfect Chronology – it’s rather good. You control Stocke, a blonde lad who likes to wear red (something he’s known for). He works for a mysterious man named Heiss – the boss of Alistel’s SI (Special Intelligence) – who gifts Stocke the White Chronicle before heading out on a dangerous quest alongside trusty companions Raynie and Marco. You learn after a harrowing end for our heroes at the hands of a dastardly Granorg general that the White Chronicle bestows the power upon Stocke to rewind time (and go back to the future, Great Scott!) You will need to traverse time in order to save the continent of Vainqueur, doomed to turn into a vast, uninhabitable desert. What follows is a plot with as many twists and turns as a… er… twisty-turny thing. Nations at war, personal conflicts, many side-quests to sink your teeth into, this game has it all. It is up to you to right any wrongs you may incur upon the world. If you get something wrong, you will be taken to an ending screen, but not to worry, your trusty, but savagely mysterious, guides Teo and Lippti will help you along the way. Get something wrong and you can return and try again at any time. Towards the start of the game, you will be forced into making a decision whether to stay working for Heiss and the SI, or to go off and become second-in-command alongside your old pal Rosch in the army. This is the single most important decision in the game and literally splits the game’s story in two. Throughout you will be swapping between the Standard History and the Alternate History to enact changes in both – as long as you have unlocked a node to travel to (this happens as the game goes along). Think of the time-travel mechanic as more like the Light/Dark World aspect of Link to the Past. It may seem intimidating to begin with, but Radiant Historia: Perfect Chronology is a simple enough game to get your head around. Despite the complicated nature of the plot and time-travel mechanic, Radiant Historia is a relatively linear experience. The world is split into towns/cities and the dangerous outdoors. Yes, you can travel between any nodes at any time via a save spot (of which there are plenty), but stick to the story and it all moves along at a brisk pace throughout the 20-60 hours you’ll spend in Vainqueur. That is, depending on difficulty, overall story option (Append, which is the same as the DS original, Perfect, which adds in a new third timeline of “what if” scenarios) and amount of side-quests you take on (do them all and you’ll see the “true ending”). Taking the game on in the brand-new easy mode, for example, takes the turn-based battles out of the equation for the most part, doing away with them if you slice the enemies on the field while giving you experience points still for those pesky boss-battles. How you play Radiant Historia: Perfect Chronology is entirely up to you, but you will want to take part in as many battles as you can in any mode. The battle system is a tremendously smart one. On the top screen, you will see your team of three and the enemies, you’ll notice that the enemies are placed on a 3×3 grid. This is important. The key to besting your enemies is chaining as many attacks as possible (this also grants you more experience and coinage). The bottom screen shows a list of attacks, with ten shown at any one time. You can change your turn placements in the list by choosing the change option, but take note; you will be more suspect to critical damage before your next attack. Time everything well, however, and you can chain ten attacks in a row, and even take out all enemies in one turn. Each character comes with special attacks and some can send enemies flying into one another either left, right, backwards or forwards. If you can chain everything correctly, you can get every enemy placed on one square together and unleash hell. It’s an intelligent system in a game full of them. 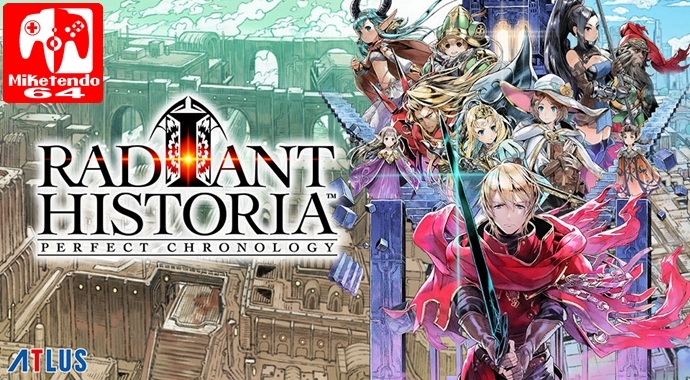 Radiant Historia: Perfect Chronology is an addictive game, perfect for short blasts or lengthy sessions thanks to plentiful save spots and the ability to quick save wherever and turn the game off. Chaining ten attacks and besting all enemies at once is always a great feeling, so too is making the right choices. There’s plenty to get on with for all you completionists out there, too. The game shows you just how many plot points you’ve discovered, and there are over 280 in all. Complete everything and you’ll be rewarded with the game’s “true” ending. The time-travel mechanic is smart, but I do wish it was signposted better. You’ll be left scratching your head trying to remember exactly where specific story beats took place, especially if you go after the countless side-quests. You get little descriptions of what happened, but not much more than that. Need to go to Granorg? Fine, it will tell you, but you’ll have to remember exactly what node to travel to in Granorg. An oversight should have been ironed out as part of the remake. JRPG fans are spoiled rotten on the 3DS. Atlus have made a big impact on Nintendo’s 3D machine, and Radiant Historia: Perfect Chronology is just another example of a great RPG from the company. While I can’t really recommend this remake to those who played the DS original (at least wait for a price drop), for the many that never played it Perfect Chronology comes with a glowing endorsement from this writer. It’s smart, built around a great plot, exciting battles and awesome time-travel mechanics. While I wish the game was playable in 3D, I cannot recommend this enough for those looking for yet another JRPG kick on their 3DS.